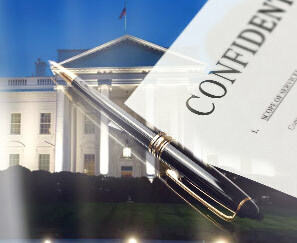 Recent news reports indicate that White House staff have routinely signed non-disclosure agreements (NDAs) limiting what they can say about their public service. On Aug. 14, White House spokeswoman Sarah Huckabee Sanders observed that it is "common in a lot of places for employees to sign NDAs, including in government, particularly anyone with a security clearance." But are these agreements legally enforceable? Officials for former administrations of both parties reject any suggestion that NDAs were common, except in cases related to access to classified information. Moreover, a string of court cases raises questions about whether NDAs are enforceable for former public employees in matters dealing with non-classified information. In the private sector, a NDA is a contract in which the parties promise to protect the confidentiality of any secret or proprietary information disclosed to them and often includes a non-disparagement clause. The reports that President Donald Trump, who relied on non-disclosure agreements routinely in his private business enterprises, has required broad NDAs for dozens of White House employees appears to expand their use into a new arena. No question, current government employees have limited First Amendment rights. Most recently, the U.S. Supreme Court ruled in 2006 that public employees can be terminated or disciplined for speech connected to their jobs. Although this ruling would apply to current White House staff and political appointees, courts have distinguished between the rights of current and former government employees, as well as classified and non-classified material. In Snepp v. United States in 1980, the Supreme Court upheld pre-publication restrictions for federal government employees who work with classified documents. In that case, the justices ruled that an ex-CIA agent, Frank Snepp III, breached his agreement with the agency when he published a book about CIA activities in South Vietnam without first allowing the CIA to review his disclosures. The court directed the ex-agent’s profits into a trust for the government. Also, former employees who divulge classified information can be criminally prosecuted. But the recent issue with non-disclosure agreements raises a different question: Can White House employees be bound to these agreements once they leave government, even for non-classified materials? As described by The Washington Post, the NDAs extend to former employees and impose severe penalties for violations. Legal challenges during the 1970s and 1980s, again involving the CIA, suggest the government has no legitimate interest under the First Amendment in censoring unclassified information. First Amendment experts say the rulings would pose hurdles if the Trump administration attempts to enforce broad non-disclosure agreements. And any NDAs would also be covered by The Whistleblower Protection Enhancement Act of 2012, which substantially strengthened job protections for whistleblowers who expose waste, fraud, abuse, mismanagement and threats to public health and safety. After its enactment, federal entities such as the Department of Justice and the Department of State issued guidelines reminding employees that their “non-disclosure policies, forms and agreements” do not supersede the new whistleblower law. In short, even if non-disclosure agreements are required of White House employees, the agreements would likely not be legally enforceable once an individual leaves the government unless they relate to access to classified information.